Jimi Hendrix Guitar Riffs, Voodoo Child (Slight Return) - Free Jimi Hendrix Guitar Riffs! This free Jimi Hendrix guitar riff is "Voodoo Child (Slight Return)". Here's the intro to the song and I'll teach you any other parts if you request it. This is right after the Wah-wah intro. It is based on the E Minor Pentatonic Scale with alot of fuzz and distortion. Have fun with this classic Jimi Hendrix guitar riff, put on a head band and learn to play the guitar! "Voodoo Child (Slight Return)" is tuned down 1/2 step so make sure your guitar is in tune by going to the guitar tuner page. 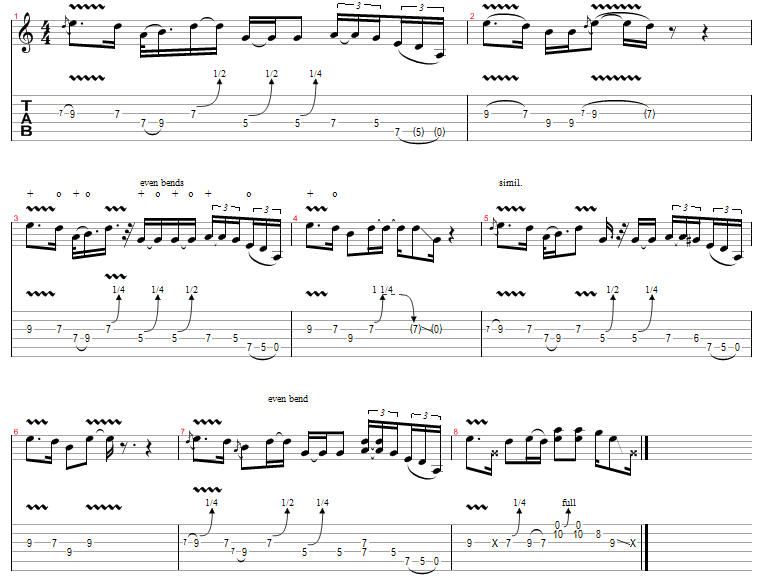 If you don't want to tune your guitar down for this song then just add 1 to each note shown on the tabs below.